Building owners and managers of 438 Downtown Pittsburgh and Oakland locations are on-track to collectively reduce energy use by 10 percent by the end of the year. An effort launched by the Green Building Alliance in 2012 to lower the environmental impact of buildings in Downtown Pittsburgh and Oakland has been recognized by the International Downtown Association for revitalizing a business district. The 2030 District effort to cut energy consumption, water use and transportation emissions in half by 2030 is one of just four programs nationwide to receive the award this year. The initiative invites those building partners to meet once a month and discuss the specifics of projects they are working on to save money, energy and make their buildings work better. “We have a number of buildings we are working with, 438 buildings so it’s actually a big number but in a small, densely packed geographic region. And that’s one of the nice things about the geographic constraints of Pittsburgh, is that everybody is so close together that it’s helpful for neighbors to help neighbors on ways to improve their buildings,” Anna Siefken, Director, 2030 District said. Often they start with the low-hanging fruit of replacing outdated lighting with LED bulbs. A business can partner with Duquesne Light under Act 129 and receive rebates for updating lighting systems, often paying for themselves in less than a year. Siefken said those smaller changes are a gateway to addressing bigger issues such as replacing outdated HVAC systems. The initiative tracks and compares a building’s energy data to others of similar size. “So it’s not modeling for the building, it’s not what the building could do or should do. It really is what the building is doing. People get a real sense for how their building could perform if they make the kinds of improvements we’re talking about on an ongoing basis,” she said. 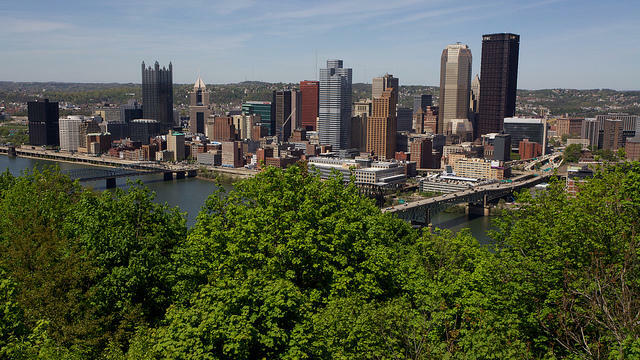 Pittsburgh is one of 11 district cities in the 2030 initiative. Siefken said that collaboration is important as many of the cities share challenges in trying to get both big and small building owners to buy into the changes. The effort to reduce the carbon footprint of older Pittsburgh buildings is expanding beyond downtown to the area called “the Bluff” which houses Duquesne University and UPMC Mercy. The Pittsburgh 2030 District: Downtown has a goal of a 50 percent energy, water and transportation emissions reduction by 2030. This better connects downtown to Oakland – though there are no plans to expand into the area between. It’s been a year since the beginning of Pittsburgh’s 2030 District Challenge. The private-public initiative aims to cut energy, water and transportation consumption of downtown buildings in half by the year 2030. According to Sean Luther, Director of the Green Building Alliance, a number of the big name buildings have signed on to the program’s pledge. Some of the most notable buildings include the US Steel Building and one of the oldest buildings downtown, the Allegheny Courthouse. In total, the buildings involved in the challenge account for more than 50% of downtown’s square footage. The city of Pittsburgh and the Pittsburgh Downtown Partnership announced Envision Downtown on Thursday, a public-private partnership that aims to create more “complete streets” downtown. That means a better experience for pedestrians, improved transportation and better use of land.